Editor’s note: This is the third of three articles published concerning community energy and the benefits that it offers. The first article can be seen here and the second here. 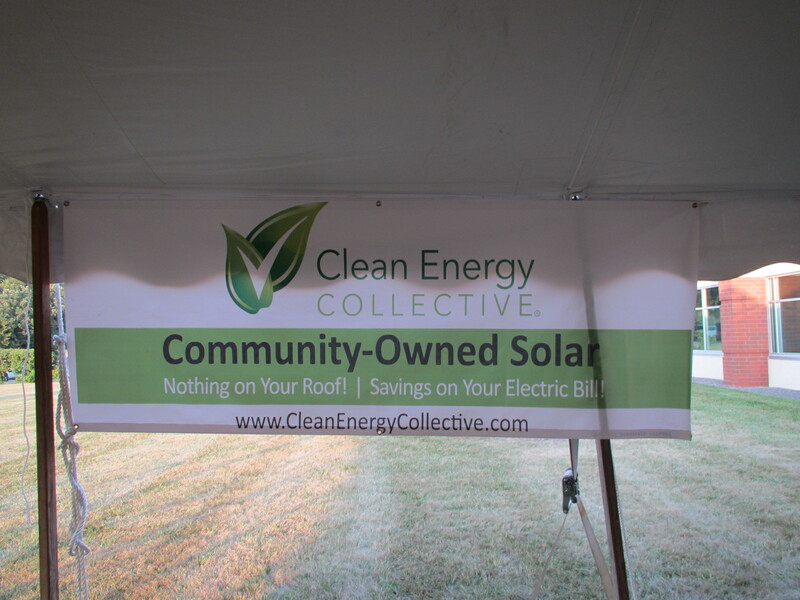 This series has focused on the benefits of community owned energy. Large traditional energy companies have a responsibility to their shareholders to make a profit. However, as community energy groups don’t have such obligations it enables them to benefit from a range of different governance structures. Energy governance can be defined as “rules, processes, practices and behaviour that affect the way in which energy is generated and used”. With the industry continuing to develop and the price of renewable energy continuing to drop, there are increasing numbers of innovative options for communities. This article highlights some of the options available and what must be considered when deciding on a governance structure, building upon the previous articles in the series. select the one that is most suited to their needs and resources. One of the primary considerations has to be the level of risk versus reward for the community. While many models can fit in along the continuum, a basic view shows 100% ownership as higher risk but with a high reward in comparison to community benefits from commercial projects which are very low risk but equally low reward. Any energy project requires a lot of work and communities often have to rely on volunteers to give their time towards planning, engagement, writing grants and publicity with no guarantees any project will go ahead. Projects require a significant sum amount of capital finance. Prior to any money being generated funds are required for feasibility studies, planning and construction. Due to a lack of finances, expertise and reliance on volunteers, community projects take longer to complete than commercial projects, therefore, a longer period of time with no money generation. This time frame can also see communities miss out on more favourable policies such as high feed-in-tariffs. Once the system is fully functional, the community would be responsible for maintenance. On the positive side, if a community can achieve a 100% community project, the financial benefits can be vast. Often, investors will get substantial returns with plenty left over for community projects. In this case, the community will have complete say in the direction of the project. So what governance options are there? Certainly the most common model with a proven track record in countries across the globe, co-operatives have a number of benefits for communities looking to take ownership of their project. They are very inclusive, allowing people to invest from only a hundred pounds up to thousands. The local community is usually given first refusal on share offerings and have the potential to earn a significant return on their investment. It is also a very democratic structure with all members allowed one vote regardless of investment amount, ensuring local interests are met fairly. While there are shareholders in a co-operative, its main aim is not to make larger and larger profits each year. They are run as not for profit entities which also helps to keep energy costs down in the event they work as a distributor as well as energy generator. This is possible on a micro grid system. A lower risk option for communities is to share ownership with a larger commercial or government body. This form of governance does reduce the say a community can have in a project as they are unlikely to have equal voting rights. However, it can remove the barriers of capital financing and facility management, enabling the project to be completed in a shorter time frame. 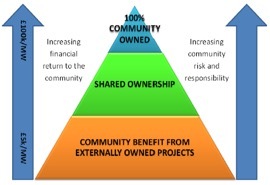 The ownership option can either take the form of communities buying a stake in a project, for example the community owns 30%. Or alternatively the developer “loans” the community energy generation equipment, e,g. a turbine. This is then paid for using the money it generates, with the community reaping all the financial benefits thereafter. Shared ownership doesn’t have to be alongside developers. By using structures such as community land trusts, communities can partner up with housing associations, farmers or local government. Such models can also be used to develop low cost, environmentally friendly housing, providing many holistic benefits for the local area as described earlier in the blog series. An even lower risk option is for the developer to pay the community benefits for having energy generation in their community. While strictly speaking not community ownership, it is a best practice for developers and enables the community to sort benefits from clean energy with zero risk. While this can be an annual monetary payment it can also take the form of local building retrofits, improved local facilities or reducing local energy bills. It is common for the community to set up a charity to manage the fund. While the options above provide a broad overview of community options there are limitless structures available, each of which have their own pros and cons. Deciding the correct governance structure is a big decision for communities looking to delve into renewable energy. The key questions to ask are how much risk are they willing to take? Do they want to maintain the system? How much capital can be raised? How much input does the community want into the running of the project? A great benefit of community energy is that communities can decide what risk versus reward is best for them and there are systems in place that can be used to meet their requirements. Most importantly these systems give them ownership over a project, engaging them in the process and ensure significant benefits to the local economy. Image courtesy of Flickr. Originally published by S&S on May 24, 2017. Dan graduated from Exeter University in 2015 with a Masters in Sustainable Development. He has a strong interest in holistic energy solutions and has worked on community energy and sustainability projects in the UK. Dan is currently based in the USA working with the United States Green Building Council of Nevada on policies for the 2017 legislation period. Outside of sustainability, Dan is passionate about sports, cooking and travel.